Over the last few decades, the food industry has seen a rise in Americans who want to know more about their food: Where it’s from, how it’s grown, what’s in it, etc. Due in part to this trend, the United States Department of Agriculture’s (USDA) organic seal on product packaging has become increasingly prevalent and the use of the term “organic” is commonplace. This blog will cover when you can use the term “organic,” your placement options, and if it’s appropriate to use the USDA organic seal. If you want to use the term “organic” on your label, the exact wording you have to use depends on the amount of organic ingredients your product contains. What constitutes organic is spelled out in the CFR §205.600-205.606, but it essentially means grown or produced using natural substances and mechanical or biological farming methods. Placement: You can include the USDA organic seal and a “100% organic” claim on the principal display panel (or PDP, the part of the container or package most likely to be seen by the consumer — usually the front). If you use the seal or a claim, you must identify organic ingredients with an asterisk or other mark in your ingredient statement. Placement: You can include the USDA organic seal and an “organic” claim on the PDP. If you use the seal or claim, you must identify organic ingredients in your ingredient statement with an asterisk or other identifiable mark. Placement: You can state “Made with organic (up to three specific ingredients or ingredient categories)” on the PDP, but you may not use the USDA organic seal or otherwise represent the product as organic. If you use this claim, you must identify organic ingredients in your ingredient statement with an asterisk or other mark. Placement: You cannot use the USDA Organic seal or the claim “organic” anywhere on the PDP. You can only use the word “organic” within the ingredient statement. 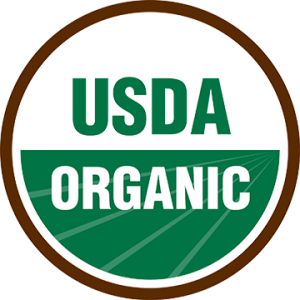 In order to use the USDA organic seal, your product must meet requirements for the “100 percent organic” or “organic” claims as explained above. Products with less than 95 percent organic ingredients may not use the seal on product packaging. If you use the USDA seal, you must replicate the form and design shown in the example to the right, and the seal must be printed legibly and conspicuously. A white or transparent background with a black outer circle and black “USDA” on a white or transparent upper half of the circle with a contrasting white or transparent “organic” on the black lower half circle. The green or black lower half circle may have four light lines running from left to right and disappearing at the point on the right horizon to resemble a cultivated field. For further information on the definition of the term organic please consult Subpart D of the eCFR. Genesis R&D Supplements now offers organic percentage tracking to make it easy to see what definitions you meet. This tutorial shows you how that works.